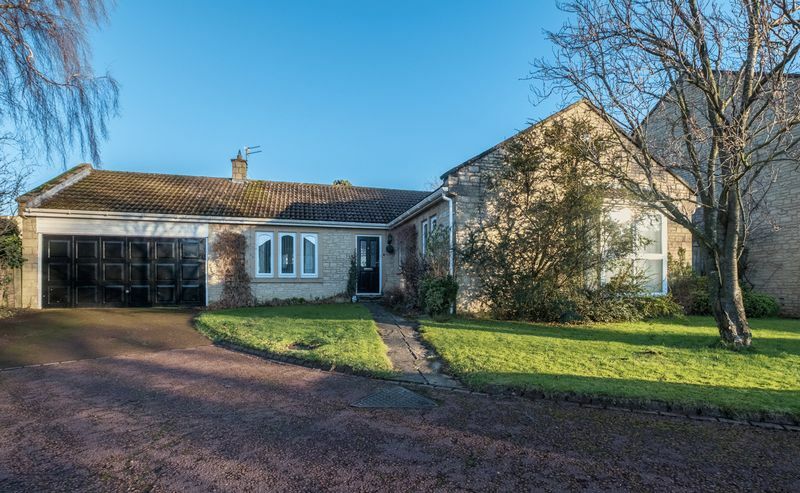 Property Rung are delighted to bring to the market for sale, this 3 Bedroom Detached Bungalow in the sought after location of Beech Close, Melton Park, Gosforth. Extremely Rare to the Market, this fantastic property is situated within a very private plot. 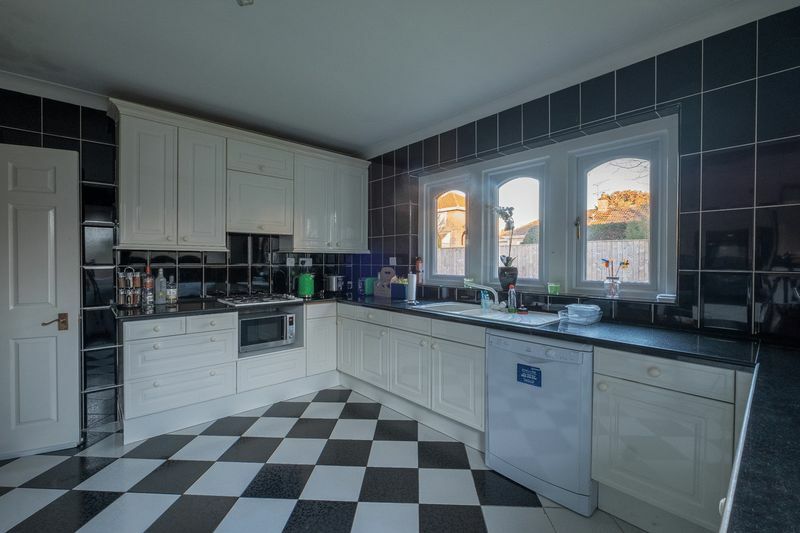 The property briefly comprises of Lounge, Dining Room, Kitchen, Family Bathroom, Master Bedroom with En-Suite Shower-Room and a further two Bedrooms. 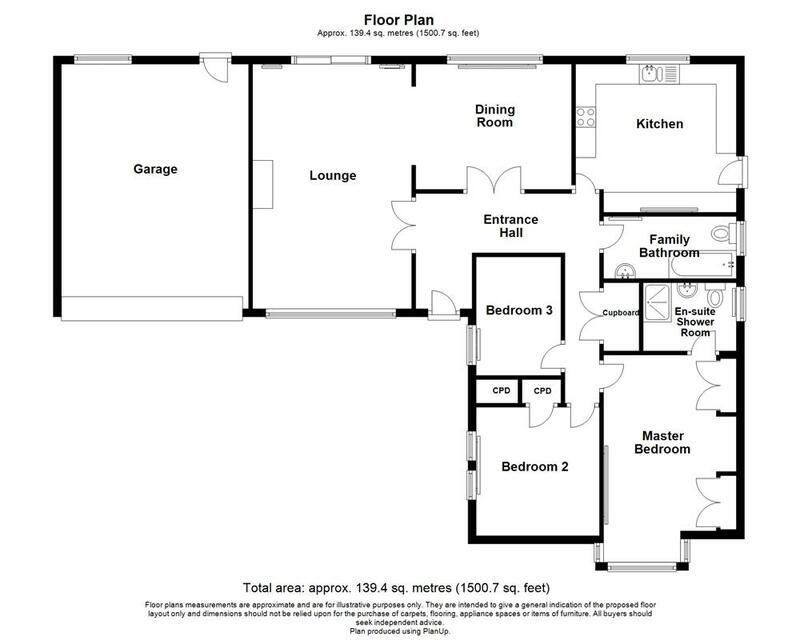 The spacious accommodation also benefits from an attached Double Garage and Private Rear Garden. 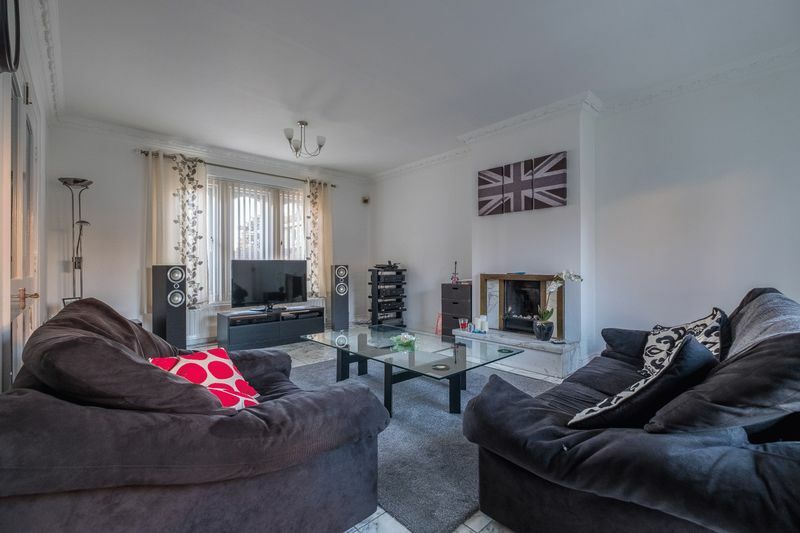 Situated close to local amenities and public transport links with convenient access to major road links including the A1 North and South. The property must be viewed to fully appreciate what it has to offer. Through the double glazed front door we step into the Entrance Hallway providing access to Lounge, Dining Room, Kitchen, Family Bathroom, Master Bedroom & En-Suite Shower room and Bedrooms 2 & 3. 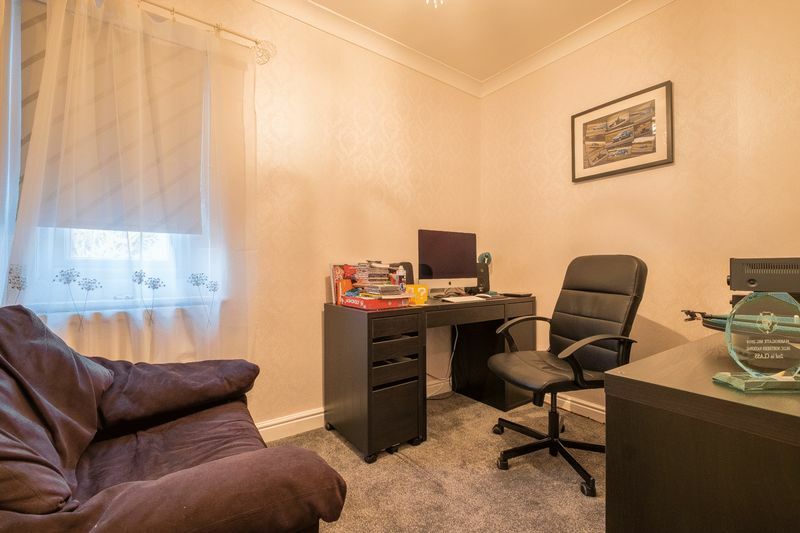 Features of the room include single radiator and carpet underfoot. Entered via the Entrance Hallway, The Lounge extends from the front to the rear of the property. 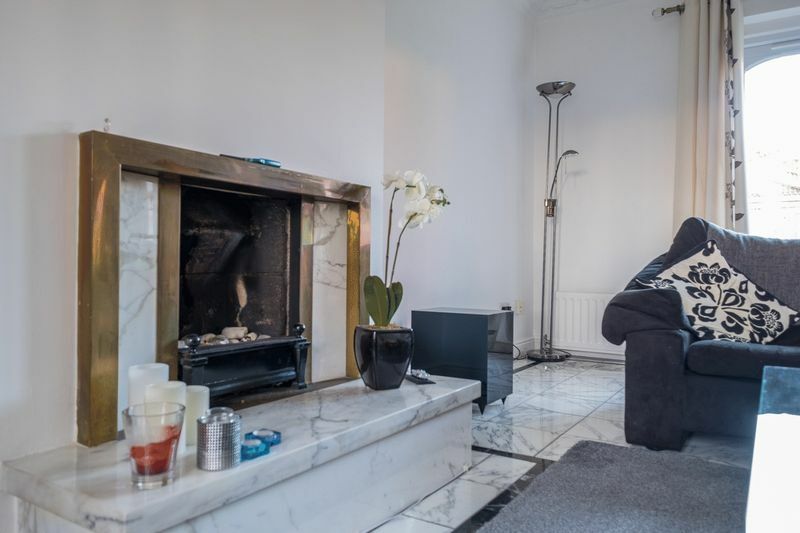 The focal point of the room is the fire-breast with marble hearth and inset pebble flame effect fire. 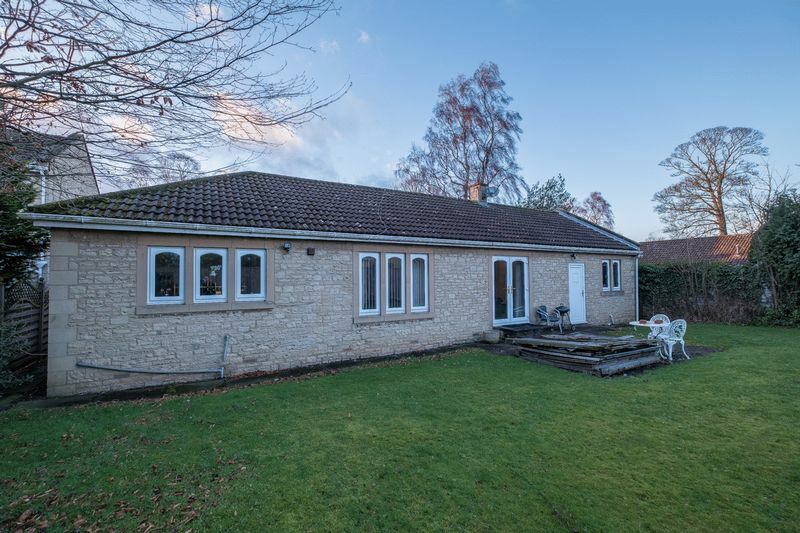 A Double Glazed windows look out to the front elevation whilst the rear of the property can be viewed and accessed via french doors which lead into the private rear garden. Other features of the room include, two double radiators, a marble floor under foot with contrasting and complimentary border and a decorative archway provides access in to the dining room. The spacious Dining Room is a fantastic entertaining space with access via a decorative archway from the Lounge or via double glass panelled doors accessed from the Entrance Hallway. The Dining Room benefits from a double glazed window to rear elevation and marble flooring with contrasting and complimentary border underfoot, flowing continuing from the Lounge. The Kitchen is fitted with a range of white wall and base units complimented by black marble effect work surfaces over-top. 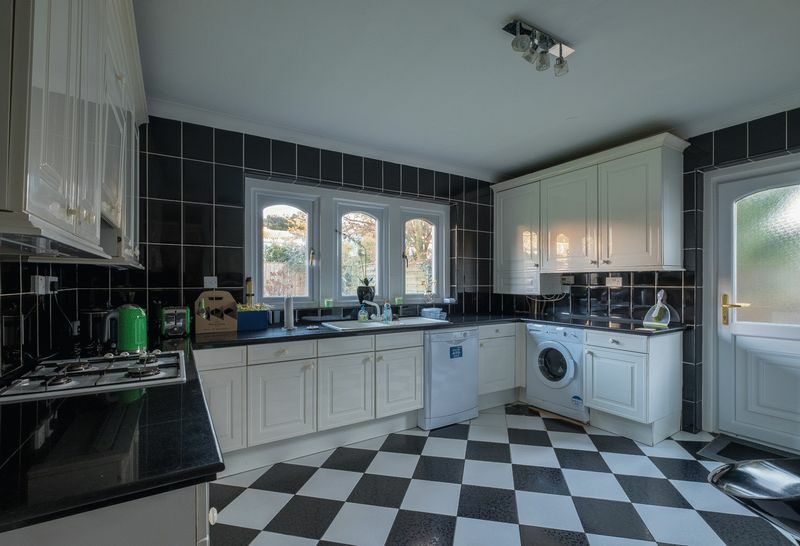 Integrated appliances include Hotpoint oven, Gas hob, integrated 1.5 bowl inset sink with drainer & mixer tap and plumbed for automatic washing machine. Other features of the room include a double glazed window to rear elevation, rear door leading to the side of property and provate rear garden. 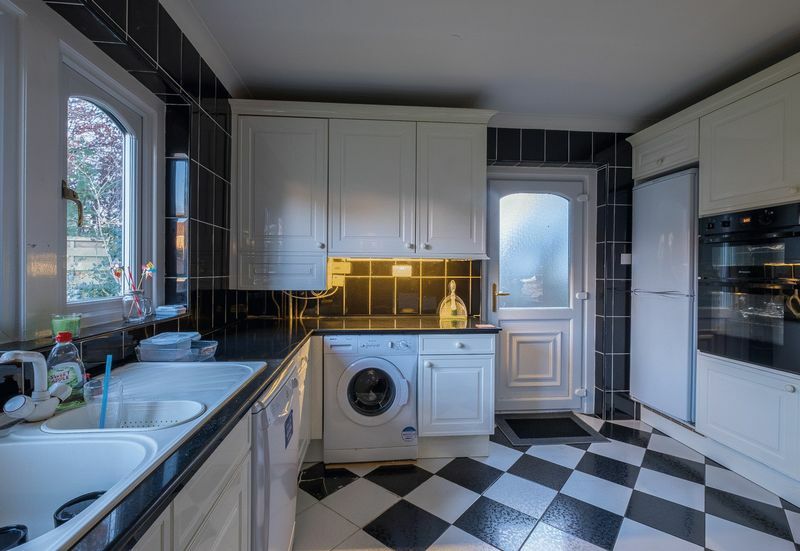 Double radiator and complimentary black and white tiles under-foot. The Family Bathroom consists of a white three piece suite comprising of panelled bath, pedestal wash hand basin and low level WC. 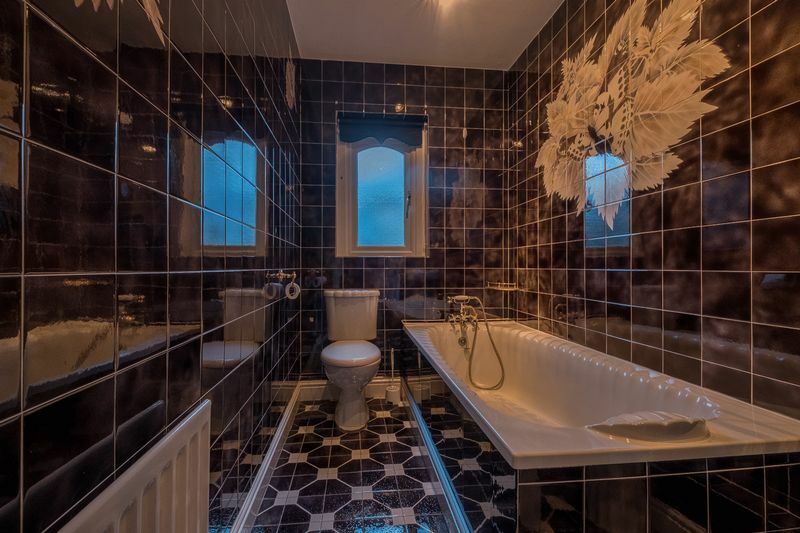 The bathroom is tiled from floor to ceiling and features a single radiator and double glazed opaque window to side elevation. The Master Bedroom is situated to the front of the property and benefits from a walk-in style bay window to front elevation. 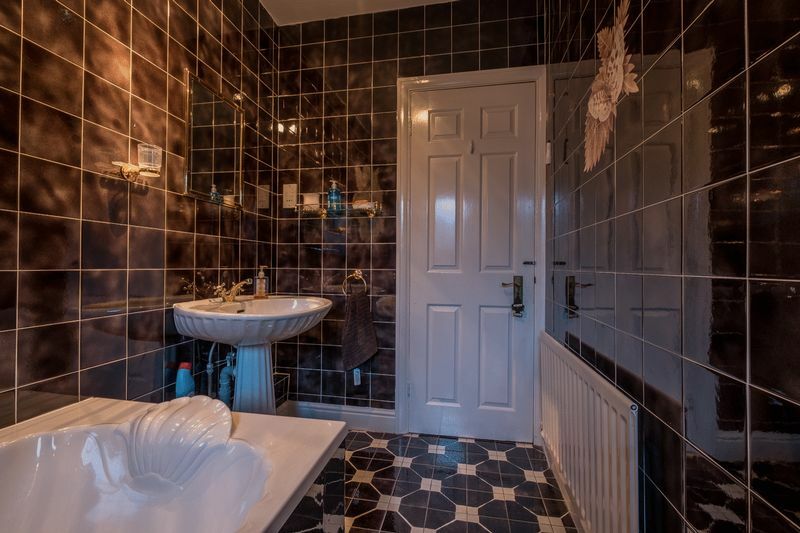 A door to the left provides access to the En-Suite Shower-Room. 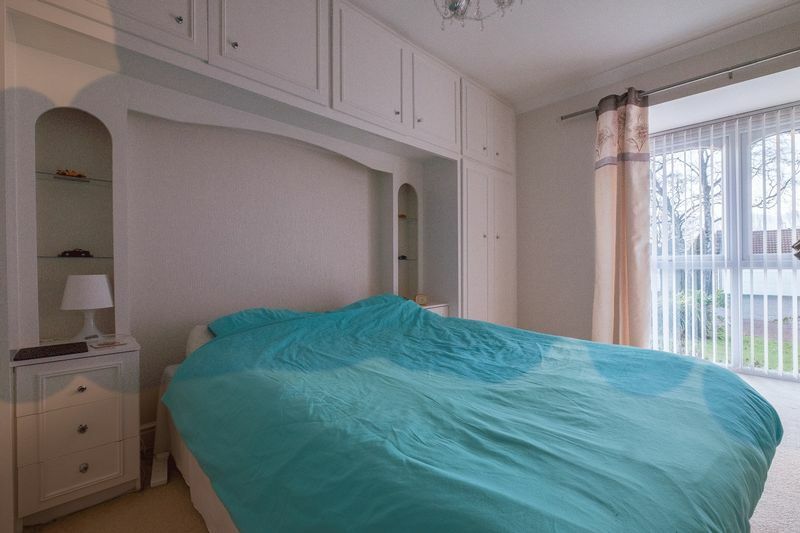 Other features of the room include fitted over-bed wardrobes, a double radiator and carpet under-foot. The En-Suite Shower-Room consists of tiled shower cubicle with power shower, pedestal wash hand basin and low level WC. Other features of the room include a double glazed opaque window to side elevation, single radiator and blue decorative ceramic tiles from floor to ceiling with contrasting blue and white floor tiles under-foot. 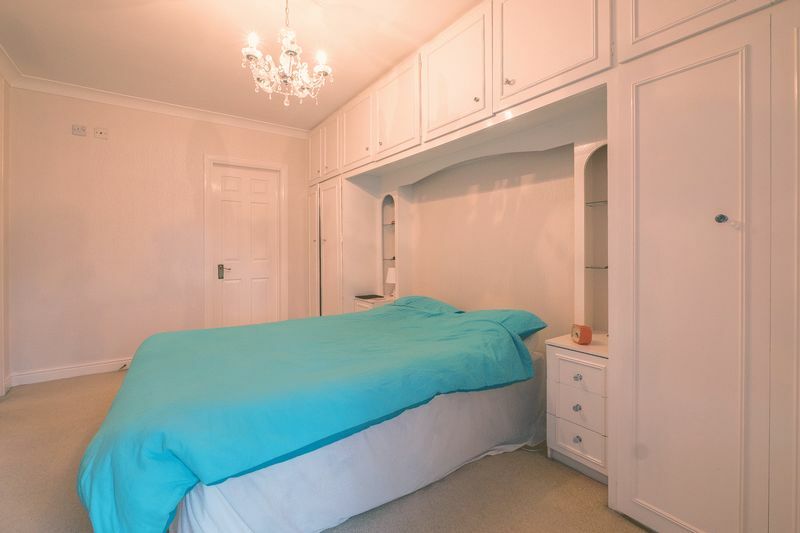 Bedroom 2 is a spacious double room with built in storage cupboard, double glazed window to side elevation, single radiator and carpet under-foot. Bedroom 3 benefits from a double glazed window to side elevation beneath which is a single radiator. Other features of the room include a walk in storage cupboard and carpet underfoot. Attached Double Garage accessible via the private rear garden. The Garage benefits from electrical sockets and lighting. A Double glazed window looks to rear elevation and to the front of the garage is an up and over door accessible via the front driveway. 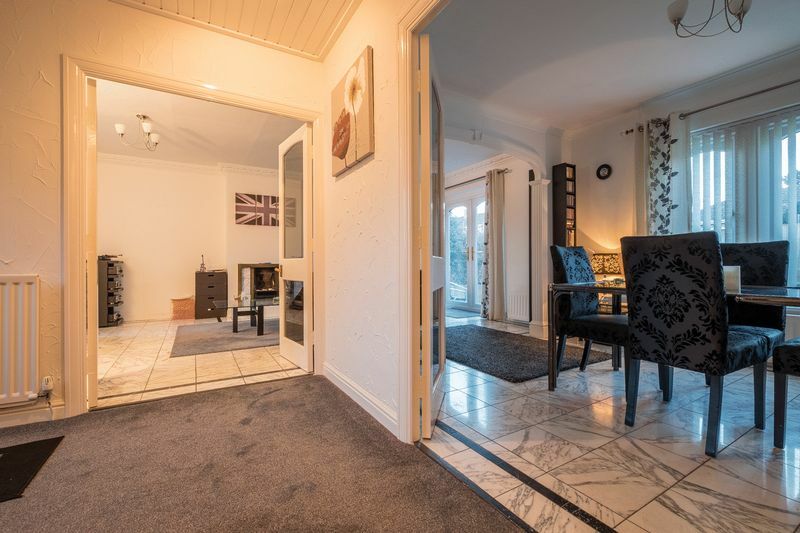 To the front of the property is a low maintenance lawned area with established shrubbery, a paved pathway leads to the front door and to the left of the door is a private tarmac driveway leading to the Double Garage. 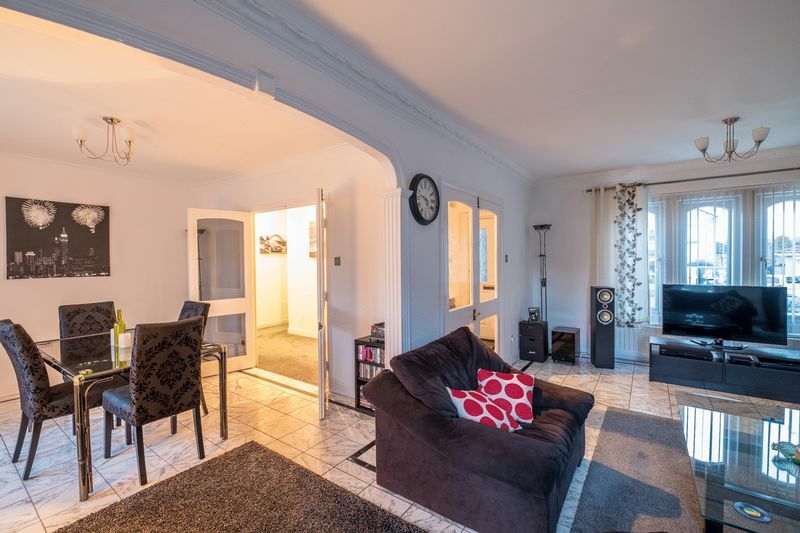 The rear of the property benefits from a private enclosed garden laid mainly to lawn, with patio area situated in front of french doors leading from Lounge.